Jan Terpstra was born and raised in Holland. He began studying the trumpet at eight and piano at sixteen. He earned his degree as piano teacher at Brabant Conservatory. Then he started to play the didgeridoo. July 1998 he travelled to Australia. For one week he stayed in the aboriginal community of one of the best didgeridooplayers and makers of the WORLD, Mr. David Blanasi. He had the possibility to buy one of the masters didgeridoo's and also received teachings in traditional didjeridu playing. These teachings together with earlier workshops from Mark Atkins(didjeridu player of the year 1995), Alan Dargin, Sonny Cooper (Yorta Yorta tribe), Stephen Kent, Gary Thomas and many teachings from the Hungarian shaman Joska Soos gave him the possibility to develop as didgeridoo - player and teacher. Terpstra gave concerts on radio and television in Holland and Belgium. Solo didgeridoo, Tibetan Singing Bowls and Bell, Balinese gong , shamanic drum, maracas, clapping sticks, bull-roarer. Duo + Flute player Jan Baggerman (bass-flute , flute , piccolo and Indian flute). Duo + Didgeridoo - player Peter Gerritsen. Duo + Indonesian dancer and artist Shelley Lapre. Battle of the butterflies + 1 didgeridoo , 10 percussionists , 1 African singer , laser show. Palace 't Loo in Apeldoorn, the Beurs van Berlage, the Rai, the Soetereintheatre and the Amstelchurch in Amsterdam, the Dutch Congresgebouw in the Hague, Schouwburg in Tilburg, Noorderligttheater in Tilburg, 013 in Tilburg, Kloveniersdoelen in Middelburg, Rotterdam Cruise Terminal in Rotterdam. Prices per course are about f 200,- per person. During the lessons original didgeridoo's can be used. For more information you can contact the Music schools. 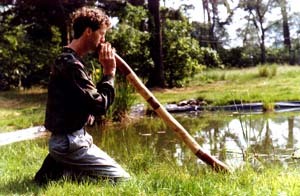 He also gives didgeridoo-workshops for beginners and advanced players, 10.00 a.m. - 17.00 p.m., fl.85,-. Private lessons: f 60,00 per hour, (fl.50,- ,until 20 years old). The Didgeridoo courses will be given for beginners as well as advanced players. Terpstra sells Barramundi didgeridoo's in Tilburg.